Laugh Out Loud with CafeMom’s Mad Life Parenting Show! This post is brought to you by CafeMom. All opinions are my own. I’ve been a fan of CafeMom for years. It’s always been one of my go-to sites when I’m looking for realistic and practical parenting advice. Plus they have these fun little games for taking a few minutes for yourself. As much as I’ve used the site over the years, how did I not previously know about Mad Life? The CafeMom exclusive is in its third season, after all! Now that I found it, though, I’ll be watching it a lot! Mad Life is a weekly web show featuring CafeMom co-founder Andrew Shue (yes, THAT Andrew Shue, from Melrose Place! ), along with his mother-in-law Joanie and comedian Chuck Nice. Together, the three tackle pretty much every parenting topic, from boosting kids self-esteem to sharing confessions about their thoughts on parenting. When you have a Mad Life, just laugh! Why do I love this one so much? Because I can totally relate! My son is pretty much a homebody too. He’s really not all that into sports. I don’t push him because, honestly, I don’t want to pay a fortune for something that he doesn’t enjoy. I also don’t want to go through a weekly struggle to drag him someplace he doesn’t want to go to play a game he doesn’t even like. Why would I do that? He gets plenty of exercise riding around on his scooter or playing with friends. I wasn’t into sports as a kid and I turned out just fine. There are other fun and funny videos that will make you laugh and nod your head in agreement. Like “I Cheated at Chutes & Ladders!” Who HASN’T cheated at that game? I also cheated at Candy Land. Hey, I cheated in Jake’s favor, so it’s not so bad! I just wanted the game to be over already! I’ve been known to purposely go bankrupt in Monopoly too so I could get out of the game. The point is, CafeMom’s Mad Life make you feel better about all those secret little things we all do as parents. You’re not the only board game cheater. I’m not the only mom who is glad her son isn’t into sports. You’ll also find other fun “mom moment” things, like beauty tips and time-savers. 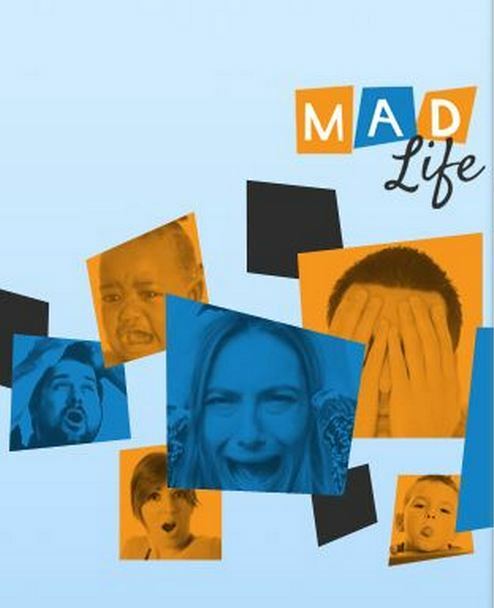 Mad Life airs new episodes every Wednesday night on CafeMom. You can watch full episodes or just the segments that interest you on their website any time. Trust me, you’ll love it! I laughed out loud too! Seems like a funny show!